K R Hassler, D M Notrica. The Nuss Procedure: How I Teach It. The Internet Journal of Thoracic and Cardiovascular Surgery. 2018 Volume 19 Number 1. Deformities of the chest wall are one of the most common congenital anomalies in the United States1. Pectus excavatum (PE) is the most common chest deformity and consists of a posterior depression of the sternum and adjacent costal cartilages. PE is commonly recognized early in life, but becomes symptomatic in adolescence.1 PE is not only associated with a cosmetically displeasing disfigurement but can cause varying levels of cardiopulmonary dysfunction. The National Institute for Health and Care Excellence (NICE) guidelines recommend that clinicians performing the Nuss procedure/minimally invasive repair of pectus excavatum (MIRPE) should “perform their initial procedures with an experienced mentor. The goal of this review is to discuss the role of the mentor in perioperative decision making. Surgical correction of PE has an extensive history, dating back to the early 20th century. The procedure has progressed from an open anterior chest wall approach with extensive costal cartilage resection and sternal osteotomy, typified by the Ravitch procedure3, to a minimally invasive thoracoscopic approach, the Nuss procedure4. The Nuss procedure has evolved significantly since its introduction in 1998. The procedure has been known to have a very lengthy learning curve but is associated with excellent long-term results 5,6. The National Institute for Health and Care Excellence (NICE) guidelines recommend that clinicians performing the Nuss procedure/minimally invasive repair of pectus excavatum (MIRPE) should “perform their initial procedures with an experienced mentor.”4. The goal of this review is to discuss the role of the mentor in perioperative decision making. A thorough history and physical is imperative. Physical examination features that should be noted include severity of sternal depression, number of cartilages involved, degree of asymmetry. All patients should have an exam that focuses on evidence for Marfan’s syndrome, and any family history of collagen disorders such as aortic aneursyms or known Ehlers-Danlos syndrome. Evaluation should also note the presence and severity of scoliosis and corporal asymmetry. The choice of imaging modality may vary based on the institution and surgeon preference, however all centers determine chest dimensions in the preoperative anatomic evaluation1. While we do not feel the extensive workup required for insurance authorization has a significant impact on clinical decision-making, the extensive workup is a current reality until insurance companies adopt an anatomic and symptom-driven criteria, rather than requiring static testing that often fails to adequately reflection the patient’s physiologic impact. Non-contrast computerized tomographic (CT) scan or magnetic resonance imaging (MRI) of the chest allows for evaluation of sternal depression/deformity, as well as evidence of cardiac compression or displacement. CT and MRI, currently allow for the most accurate measurement of pectus indices. The (Haller index maximal width of the inner chest at the maximal point of sternal depression divided by the measurement from the posterior aspect of the maximal point of sternal depression to the anterior surface of the spine) is the most common, if not the most useful index. A normal Haller index for a 14-year-old male is approximately 2.5 +/- 0.1. An index of ³3.2 is consistent with significant deformity in children with an otherwise typical chest shape. With increasing frequency, the correction index is being used to assess the severity of the deformity. The Correction Index (CI) is calculated on an axial image by drawing a horizontal line at the level of the spine and measuring the difference between the maximum and minimum anterior chest distances divided by the maximum distance. We teach the residents and fellows to think of the CI as an estimate of the percentage of increase in AP distance of the mediastinum if the patient were repaired. Echocardiogram (transthoracic or transesophageal) will evaluate for any preexisting congenital cardiac abnormalities, and generally demonstrates changes from anatomical compression.2 Similarly, electrocardiogram evaluates for any preoperative dysrhythmias. Pulmonary function tests are a static test used to identify baseline pulmonary function. Typically, results are consistent with a restrictive airway disease process, but most of the children are in the low normal range.5 Patients will often demonstrate a mildly diminished forced vital capacity (FVC), and forced expiratory volume at 1 second (FEV1)5. Cardiopulmonary exercise testing does a better job of quantifying and evaluating the amount of oxygen delivery to tissues, and can quantitate the potential for benefit from correction.6 Unfortunately, there is not as strong a correlation between exercise testing and respiratory symptomatology as we would expect.7 Recently, right heart strain has been implicated as the cause of the ubiquitous complaints of early dyspnea with exercise, which resolves after repair 2,8,9. Standard Nuss bars are composed of stainless steel and occasionally can cause an allergic reaction.10 Preoperative metal allergy testing is commonly performed prior to placement of a bar, focusing mainly on nickel, copper, and chromium. The frequency of positive testing is far higher than the clinical finding of metal allergy prior to testing, thus calling the validity of the testing into question. Family history of metal allergies, however is important in predicting metal allergy. If an allergy to components of the stainless steel are present, a titanium bar should be used, as allergy to titanium is very rare. Use of titanium must be identified preoperatively as the bars are custom-shaped by the manufacturer to minimize required bending. For this procedure, we use a general anesthetic with a double lumen endotracheal tube intubation. Single lung ventilation greatly improves the visualization of the anterior mediastinum, and also facilitates intercostal cryoablation. Patient positioning is a crucial step for a successful procedure. Early reports noted brachial plexus stretch injury from arms on armboards.11 Currently, the patient is positioned supine with gel rolls placed underneath the back, and the arms are kept adducted at the patient's side. The procedure can be separated into surgical marking and planning followed by four distinct teachable segments (1) cryoablation, (2) sternal elevation (3) anterior mediastinal dissection and bar passage, and lastly (4) bar fixation. The lowest part of the bony sternum is marked. At least one bar must be under the bony sternum, even if a subsequent bar is only lifting cartilage. Next, interspaces for entering the chest cavity are chosen and marked. These must be medial to the highest part of the chest to obtain an optimal sternal lift. When choosing the entrance site on the anterior chest, the planned location needs to have the bars crossing under the deepest part of the pectus defect. Since the ribs are attached to the sternum at angle other than perpendicular, moving the planned intercostal entrance location lateral or medial can often optimize the placement under the defect. Choosing the bar length and designing the configuration is done at this point. Aluminum templates are utilized to choose the size of the bar. The bars should reach the anterior axillary line, but not extend too far around the chest. Allowances must be made for the thickness of the soft tissues, which can be particularly challenging in overweight or female patients. Once the appropriate size bar(s) are chosen, they are then bent into the desired configuration. Much has been written on bar configurations, and this discussion is beyond the scope of this manuscript 12. Finally, the incisions are planned to allow both bars to be inserted through one incision per side. Our operative approach begins with bilateral incisions, one on the right chest by the surgeon and the other on the left chest by the resident. We generally have a second (assistant) surgeon who supervises the resident working on the left side of the chest. Without supervision, typical resident errors include beveling during the dissection, inadvertent entrance through the intercostal muscles and into the chest, dissection on top of the muscles (rather than directly on the chest wall), failure to free the pectoralis major attachments, and inadequate dissection of the pocket for the bar laterally. Typically, the resident and assistant surgeons will work simultaneously to dissect down onto the chest wall on the left. Submuscular pockets are created laterally on each side, elevating the pectoralis major muscle to allow access to the anterior chest. On the right side, single lung ventilation is initiated and a 5-mm optical port is placed through the main incision. Using a flexible tip 5mm scope, safe entry is confirmed. Carbon dioxide insufflation is used to a level of 8 mmHg pressure. A second 5-mm port is then placed in the right lower chest in an intercostal space just above the diaphragm under direct visualization. Cryoablation is performed with the AtriCure cryoablation system (Atricure, Mason, OH). Under direct vision, we count the intercostal nerves bilaterally. Interspaces 4, 5, 6, and 7 are identified bilaterally. 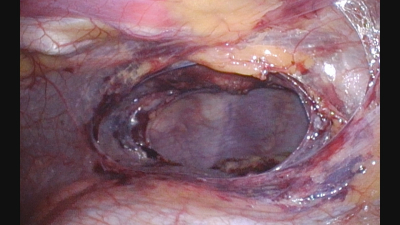 The probe is introduced through a small opening in the main incision. While holding pressure on the intercostal muscles just under the rib, the cryoablation system is activated. Ablation is performed for 120 seconds per nerve at a temperature of -60 degrees. The left side is then done using thoraocscopy through a 5mm port placed through the main incision. The cryoablation probe is placed next to the optical port. Over the years, the threshold for deciding to elevate the sternum has become much lower, and it is now rare not to do a sternal elevation. We begin with a 2mm incision at the right and left side of the bony sternum using an 11-blade scalpel. Utilizing a hemostat, the lateral sternum is palpated on either side. A Lewin spinal clamp or tenaculum is opened fully. Only one side of the instrument is held. The resident then palpates the top of the sternum for orientation, and then pushes the single jaw of the tenaculum into the side of the sternum like one would place a thumbtack into a piece of wood. The left sided tine of the clamp is then placed into the left side of the sternum and the clamp is closed. The residents are often surprised at how the metal flexes to allow the instrument to close without destroying the outer table of the sternum. The Rultract retractor is a table-mounted wench. The clamp is attached to the Rultract, and sternal elevation is achieved by cranking the Rultract. Simultaneously, using the thoracoscope to visualize the sternum being lifted off the heart. The most important part of teaching the Nuss procedure is teaching a safe mediastinal dissection and bar passage. Cardiac injury, including death, have been reported numerous times13. This has lead to numerous modifications [Notrica DM. A 20-year review of modifications of the Nuss Procedure. Seminars in Pediatric Surgery. (in press)]. Sternal elevation is often required to prevent cardiac injury and achieving the “critical view” I require my residents to maintain during the dissection and bar passage. 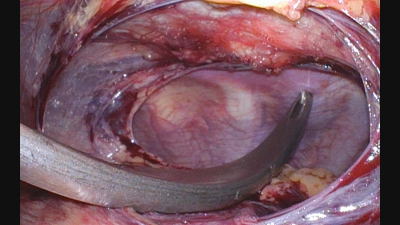 After sternal elevation, a Hunter dissector is utilized to grasp the anterior pleural medial to the internal mammary, but lateral to the juncture with the pericardial sac. A small tear in the pleura allows the carbon dioxide from the insufflator to facilitate the dissection and gain access to the anterior mediastinum. Coupled with the insufflation done earlier on the left side for cryoablation, the surgeon can often see across the chest earlier than with the original Nuss technique. This transmediastinal dissection plane is carried between the posterior sternum and the pericardial sac into the left hemithorax. During the entire dissection, the tip of the dissection instrument must be seen at all times. This is the first part of the “critical view” and generally requires a separate port and a 30 degree or flexible tip scope. An “in-line” view of the tip is inadequate to prevent cardiac puncture. At the completion of this dissection, there should be a clear view of the anterior ribs of the left hemithorax from the right side. The second part of the critical view requires the proposed exit site out of the left chest is seen clearly. The assistant surgeon generally gives the surgeon a “target” interspace by palpating externally on the previously chosen interspace exit site while visualizing with the flexible tip scope. A large Lorenz Nuss introducer is then introduced on the right side. The introducer is tunneled along the chest wall underneath the right pectoralis major muscle to the previously chosen site on the lateral aspect of the sternum. It then enters the right hemithorax under direct visualization. The introducer then traverses the anterior mediastinum, posterior to the sternum and anterior to the pericardium, in the previously dissected plane. It exits the left chest lateral to the sternum, courses underneath the left pectoralis major muscle and out the left sided incision. A #5 FiberWire (Arthrex, Naples, FL) is attached to the introducer and pulled across, or we attached a sterile suction tubing to the end of the introducer and pull it across to the right side (ref). The previously selected bar is either attached to the FiberWire, or pushed into the sterile tubing. The bar is then guided through the tract. Fiberwire is placed through the endholes on each side, and the bar is rotated into position using hemostats to rotate it. We rarely use the Lorenz bar flippers in patients with an adequately elevated sternum as significant force is not required, and the flippers are difficult to remove after rotation. At this stage, minor bar adjustments may be done to provide a perfect fit to the chest. Anterior mediastinal dissection at completion. The sternum has been externally lifted prior to the dissection allowing sufficient space for a safe dissection. Large Lorenz bar introducer traversing chest. Note the critical view of safety prior to bar passage. The exit site is clearly seen prior to pushing the bar out the contralateral intercostal space. Depending on the success of correction from the first bar, an additional bar may be placed. We make this decision based on thoracoscopic evaluation. If the pectus defect is completely flattened with a single bar, one bar may be adequate. This is rarely the case. A second bar is often required to lift the remaining pectus, which is often below the bony sternum. If a second bar is needed for improved correction, further dissection is performed to allow placement at the interspace just inferior to the first bar. There may also be a need for additional anterior mediastinal dissection if not previously carried out inferiorly enough. The Lorenz bar introducer is then passed in the interspace just below the first bar. The second bar is passed in a similar fashion and rotated into position. One of the most common complications to the original Nuss procedure was bar rotation. The use of pericostal fixation of the bar has now become standard. The bar(s) are then secured around the associated rib(s). Thoracoscopically a #5 FiberWire is passed circumferentially around the associated ribs in multiple places along the bar. Each bar is secured well to prevent from unwanted shifting or flipping. Medial or 3rd point fixation is often employed to prevent rotation. Pain control being has previously been one of the main post-operative concerns. We take multiple intraoperative steps to prevent the need of high dose or long-term narcotics. In addition to the previously mentioned cryoablation, we inject each incision with 0.25% Marcaine with epinephrine. We never leave the operating room with bars that tightly squeeze the chest. The anxiety associated with chest restrictions from tight bars are a major postoperative management dilemma and needs to be avoided. A 16F chest tube is placed through the right thoracoscopic port site to allow for CO2 evacuation and is subsequently removed prior to the completion of the case. A chest radiograph is done prior to waking the patient to make sure there is no residual carbothorax. MIRPE/Nuss procedure has undergone a number of modifications through its robust history. Integration of new more minimally invasive techniques makes this the preferred procedure for repair of pectus excavatum. Long-term data demonstrates successful results with improved aesthetic and cardiopulmonary function.3,6,8,9. The key to a reliably safe, successful correction relies not only the surgeon’s individual skill, but on adoption of important technique modifications developed after catastrophic events and courageously reported from centers around the world. As a mentor, it is important to not only teach the procedure, modifications, and variations, but also to provide anticipatory guidance to avoid common or catastrophic mistakes. Guiding the trainee in obtaining these desired traits is a constant balance of trainee autonomy and superb quality patient care. Allowing enough autonomy gives the mentor the ability to detect and correct actions before they impact patient care. In complex, highly technical operations, this can only be done after the trainee has seen enough of the procedures, and started doing basic critical elements of the operation. In many ways, the Nuss procedure is unique in its principles and may be one of the few times general surgeons or pediatric surgeons operate on non-cancerous bones and cartilage, and these differences must be factored into the teaching of this procedure. 1. 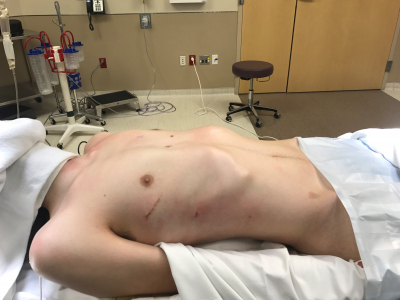 Jaroszewski D, Notrica D, McMahon L, Steidley DE, Deschamps C. Current management of pectus excavatum: a review and update of therapy and treatment recommendations. J Am Board Fam Med. 2010;23(2):230-239. 2. Jaroszewski DE, Warsame TA, Chandrasekaran K, Chaliki H. Right ventricular compression observed in echocardiography from pectus excavatum deformity. Journal of cardiovascular ultrasound. 2011;19(4):192-195. 3. Maagaard M, Tang M, Ringgaard S, et al. Normalized cardiopulmonary exercise function in patients with pectus excavatum three years after operation. Ann Thorac Surg. 2013;96(1):272-278. 4. Placement of pectus bar for pectus excavatum (also known as MIRPE or the Nuss procedure). Interventional procedures guidance [IPG310] August 2009; https://www.nice.org.uk/guidance/ipg310/chapter/1-Guidance. Accessed May 25, 2018, 2018. 5. Kelly RE, Jr., Obermeyer RJ, Nuss D. Diminished pulmonary function in pectus excavatum: from denying the problem to finding the mechanism. Ann Cardiothorac Surg. 2016;5(5):466-475. 6. Tang M, Nielsen HH, Lesbo M, et al. Improved cardiopulmonary exercise function after modified Nuss operation for pectus excavatum. Eur J Cardiothorac Surg. 2012;41(5):1063-1067. 7. Swanson JW, Avansino JR, Phillips GS, et al. Correlating Haller Index and cardiopulmonary disease in pectus excavatum. Am J Surg. 2012;203(5):660-664. 8. Chao CJ, Jaroszewski DE, Kumar PN, et al. Surgical repair of pectus excavatum relieves right heart chamber compression and improves cardiac output in adult patients--an intraoperative transesophageal echocardiographic study. Am J Surg. 2015;210(6):1118-1124; discussion 1124-1115. 9. Kelly RE, Jr., Cash TF, Shamberger RC, et al. Surgical repair of pectus excavatum markedly improves body image and perceived ability for physical activity: multicenter study. Pediatrics. 2008;122(6):1218-1222. 10. Rushing GD, Goretsky MJ, Gustin T, Morales M, Kelly RE, Jr., Nuss D. When it is not an infection: metal allergy after the Nuss procedure for repair of pectus excavatum. J Pediatr Surg. 2007;42(1):93-97. 11. Fox ME, Bensard DD, Roaten JB, Hendrickson RJ. Positioning for the Nuss procedure: avoiding brachial plexus injury. Paediatr Anaesth. 2005;15(12):1067-1071. 12. Park HJ. Technical innovations in the minimally invasive approach for treating pectus excavatum: a paradigm shift through six years' experience with 630 patients. Innovations. 2007;2(1):25-28. 13. Hebra A, Kelly RE, Ferro MM, Yuksel M, Campos JRM, Nuss D. Life-threatening complications and mortality of minimally invasive pectus surgery. J Pediatr Surg. 2017.